The Colombian Government had a problem. Throughout the long-running battle with revolutionary group FARC, hundreds of soldiers had been captured. Some of these troops had been captive for years, and the Government was looking to get a message out not to give up or lose hope. But how to pass a message directly to the soldiers without their captors knowing? The not-so-obvious answer: a pop song. Soldiers who’d been released or had escaped said one of the only freedoms prisoners enjoyed was the radio. If the Government could bury a Morse code message into a song that got regular airplay, the soldiers trained to decipher those codes would hear it while their ignorant guards would dismiss it as part of the tune. So, one of Colombia’s top military communications experts, with the help of an enterprising ad executive and a music producer, created a song that ironically caught on in FARC-controlled regions of the country. Importantly, the message was received loud and clear. The prisoners knew they hadn’t been forgotten, and spread the news with those who hadn’t heard it. “Better Days” – the pop song that was a favorite of both revolutionary and hostage – was a very uncommon example of content. It had a twin purpose: the obvious purpose of most music (i.e. entertainment and art) and a secret mission (i.e. to get the message to the soldiers). Most content doesn’t have that. Blog posts often get written just for SEO. eBooks and reports are mainstays of lead generation. Videos today are the “in thing” due to the engagement they get. And yet, we don’t create this content for the likes, views, shares or “gosh, that was amazing” emails. Content ultimately comes back to one thing: helping customers find you, then trust you… so they can buy from you. And on face value, us folk in the marketing world generally agree about that. We know a blog post isn’t going to get the cash register ringing, but it’s an important step to attracting an audience down the funnel, into the flywheel or whatever customer journey model you subscribe to. We leave conversion-focused thinking at the door, not making the conscious link between our content and the role it plays in attracting prospects. It doesn’t – and shouldn’t – have to be that way. Just like the pop song, we can sow seeds of persuasive messaging into our content without being manipulative or “scammy”. This is because that while content and sales copy may seem like opposites, they’re actually opposite sides of the same coin. That means many of the principles of a fantastic sales page can be used to good effect with all of your content. Note: when we “sell” with content, we don’t mean persuading people to part with their cash. A conversion in terms of content might be as simple as a social share or email opt-in. Way too many reports, guides, blogs, and videos seem to be written as not-so-subtle sales pitches or “product comparisons”. A sales page might get away with this to some extent (though a good sales page goes to the effort of making selling less obvious). Content is a different beast. When selling is the main element in a blog post, video or podcast, it turns readers off, never to return. This doesn’t mean you have to throw selling in the bin. It just means you have to remember why people consume your content and cater to that BEFORE you try to make the sale. If you can educate or entertain, you’ve delivered value, and more importantly, primed readers to be receptive when you ask for the opt-in, share or next step. 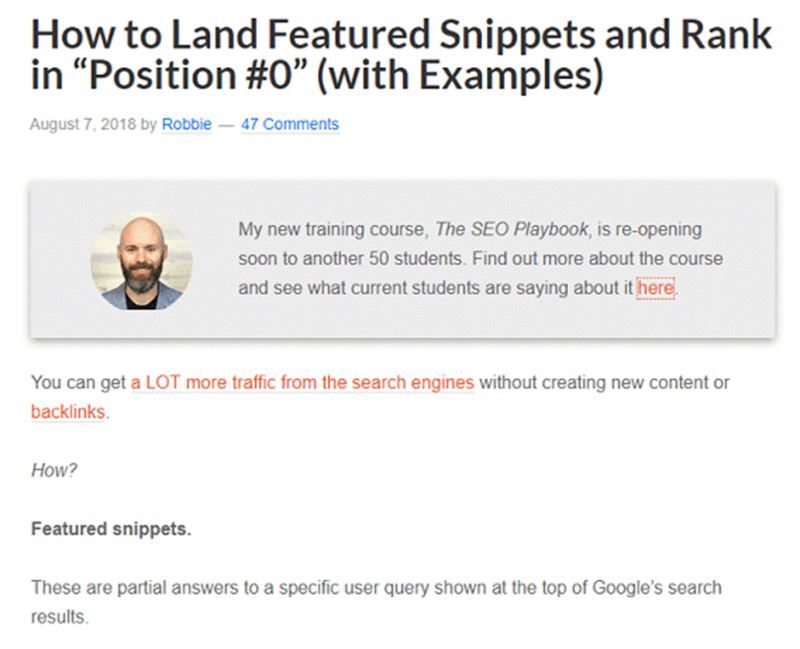 Take Robbie Richard’s blog post on getting to “Position #0” in search results. Sure, he might “break the rules” by making a short mention of his SEO course at the very beginning, but he’s careful to separate that from the actual blog, and then goes on to deliver a veritable truckload of educational value. Action 1: Never just sell in your content. Make sure your first priorities are to educate and/or entertain readers. Action 2: When you do sell, be up-front about it. Don’t sneak it in or hide it amongst the content. Your readers will spot it every time. It’s a golden copywriting rule that applies in emails, sales pages, blog posts, videos, social media. It doesn’t matter where it happens. If your sales page is a tedious read, you’re not going to sell much with it. If your blog is a snooze-fest, people stop reading and disregard you as someone to engage, follow and build a relationship with. The pop song the Colombian government used was no masterpiece, but it was catchy and entertaining enough to listen to, so soldiers had more chance of hearing it. If it had been a bore, it might have been switched off sooner and the whole enterprise a dismal failure. 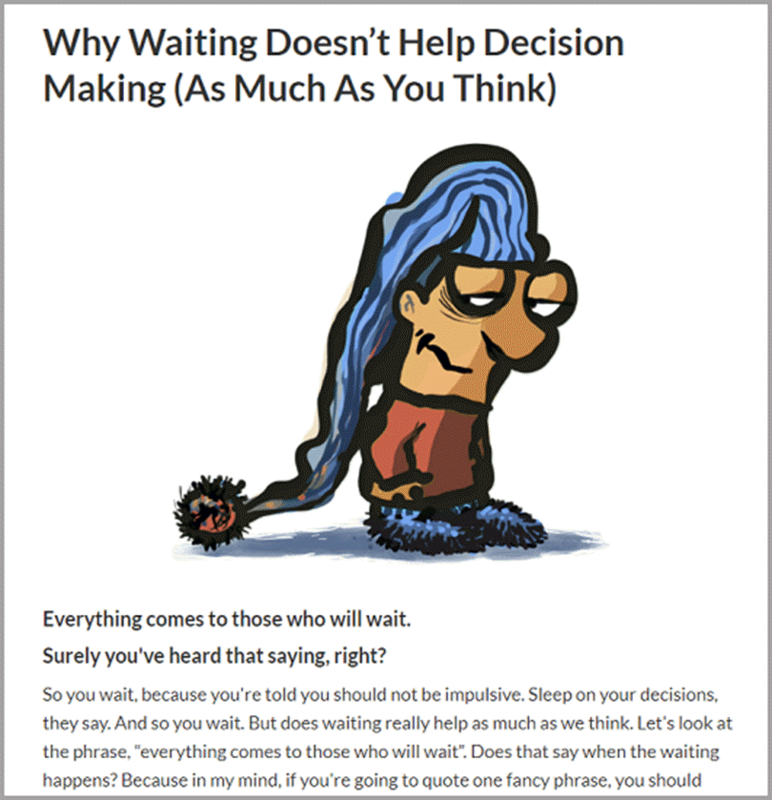 Sean D’Souza of Psychotactics is a great example of making blog posts both educational AND entertaining. His unique twist: using cartoon illustrations he draws himself and some fantastic storytelling. Action: Find a way to make your content more than just a “lesson of the day” type affair. A good sales page is an immersive experience. It can’t afford to have people land on the page, flick through for 30 seconds, then wander off. Demonstrate the product in some way, whether it’s through video, screenshots, limited versions etc. You can’t do all of that (and keep people hooked) in 500 words or so. It’s the same with content. If you really want to explore a topic properly and demonstrate you know what you’re talking about, a 500-word blog or 45-second video isn’t going to cut it. The great thing is, there’s a huge crowd of #2 readers out there. What’s more, they won’t just read: they’ll share your content (which in turn attracts a bigger audience). 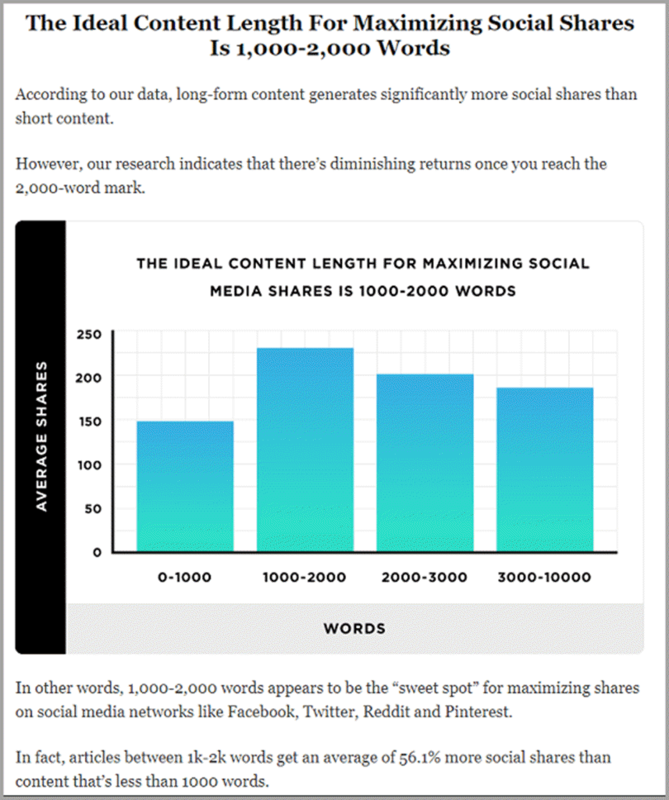 Backlinko’s Brian Dean posted a content study that found the most shared blog posts were between 1000-2000 words, followed by 2000-3000 words. Action: Where possible, explore your subject as much as is feasible. Give your audience a lot to chew on. When it comes to your best material, you don’t want to be a “content scrooge”. So do the exact opposite: give it away. Discuss your best ideas in blog posts. Talk about them in videos. Create guides, checklists, quizzes and other content from your A-grade stuff. Use material direct from your courses, training or personal processes you use. And while there are a host of reasons to do this, let’s pick two big ones (and stomp a common objection to dishing out for free). As the saying goes, you only get one chance to make a first impression. Holding back your best ideas, principles, and material means people finding you for the first time get left-over, warmed-up pap. It’s not a recipe for success. Your audience is looking for an expert figure: someone from whom they can learn, trust and (hopefully for you) buy from. When they check out your content, they decide whether you’re that person or not. The whole point of publishing content is to create an audience, some of which will tumble into your funnel to become leads, and then ultimately customers. When you publish “B-grade” material, you actively sabotage this lead generation process (and by extension, your own business). Get those readers onto your radar and into your world with el primo content. At first glance, attracting people with free stuff might seem like you’re luring the wrong crowd. And when you mix “free” with “quality”, you’re bound to get freebie seekers who will eagerly consume your content, then vanish into the night for their next feed (kind of like “content mosquitos”). Here’s the thing: you were never going to get a dollar from them. There’s little risk because there’s little reward from this group. It’s the people who DO buy from experts like yourself that you want to target, and when you use your best content, you’re actually reducing the risk of them being turned away. Plus, as studies around free trials show, people initially attracted by freebies can actually be more open to marketing, which means an opportunity for you to build that relationship. 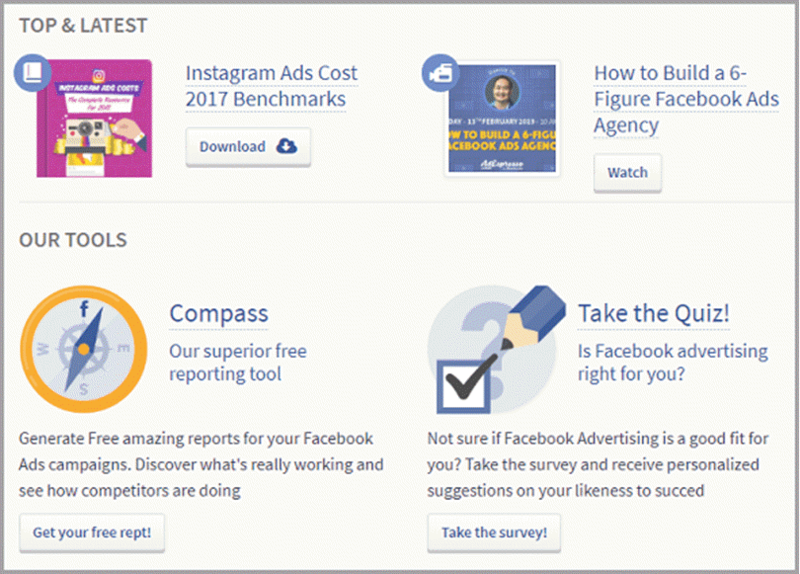 AdEspresso sells a bundle of automated tools to help businesses get more from their paid advertising. But their collection of free materials, from blogs to webinars to eBooks, is an educational cornucopia for people learning how PPC advertising works. This virtual “Academy” is a great way of advertising AdEspresso’s paid services and an incredibly effective lead generation tool. Action: Use this simple litmus test on your content: if you’re underwhelmed by what your free content’s talking about, consider your audience might be thinking the same. The message relayed to those captive soldiers was intended to boost morale: “don’t give up, we’re coming for you”. There wasn’t anything actionable about it. Your content can’t afford to be like that. It has to do more than just send a message. To illustrate the point: think of content like a door. If someone visits your video or blog post and likes what they see, they’ll happily open the door in search of more. Any of these next steps can help you build a relationship and send them deeper into your funnel. People always eagerly consume quality content, but if you haven’t hung signposts to show them where to go next, they’ll follow their own path, not yours. To wander into “meta territory”, this blog is a fantastic example of having the next step. On the sidebar, you have the chance to download a free eBook on blogging mastery. Action: Don’t publish content that’s a dead end. Always give your audience the next step to engage with you. Just like the Colombian Government’s pop hit, your content can be catchy while carrying a hidden “conversion-centric” message. Follow these guidelines, and your audience will happily consume your content while getting the signals to move them closer to your brand or business.